This image was published in the Sky & Telescope Magazine Gallery of August 2001, as Astronomy Picture of the Day on 04-July-01, in Backyard Astronomers Guide in 2002, in Newton Magazine, and in 2005 Farmer's Almanac. This picture was taken at night, well after the end of twilight. There had just been a brief rain shower at our location that moved off to the Southwest. The full moon, in the Northeast, reflected off the raindrops and created a moonbow. To my eye the moonbow appeared faintly in color. If you look very carefully, you can see a second extremely faint moonbow to the outside; it shows up better in a print. Why does this shot look like it was exposed during the day? The moon is a neutral color and reflects the same spectrum as the sun. This exposure was 400,000 times longer than would be used during the day, and the sun is 400,000 times as bright as the full moon. Human eyes do not see color well at low light levels, but the camera does. You can see the blurring of the anchored sailboats from their motions during the time exposure. You can also see stars at center left. 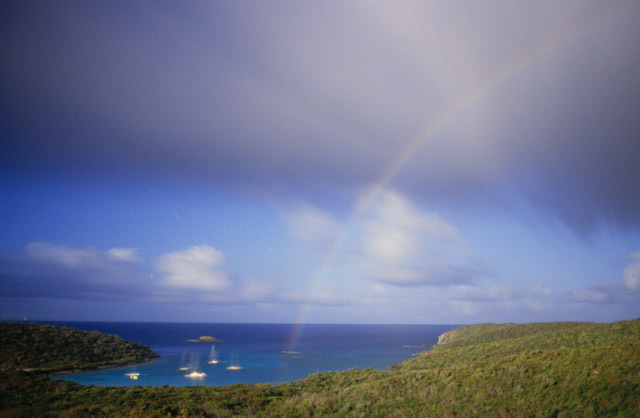 The apparent lower end of the rainbow is exactly at a reef where we snorkled the next day. We didn't find a pot of gold.